Japanese cuisine is characterized by many traditional dishes which are enjoyed on a daily basis as well as during special holidays. Don't hesitate to delve right in and explore these dishes that are heavily entwined with the culture of Japan. 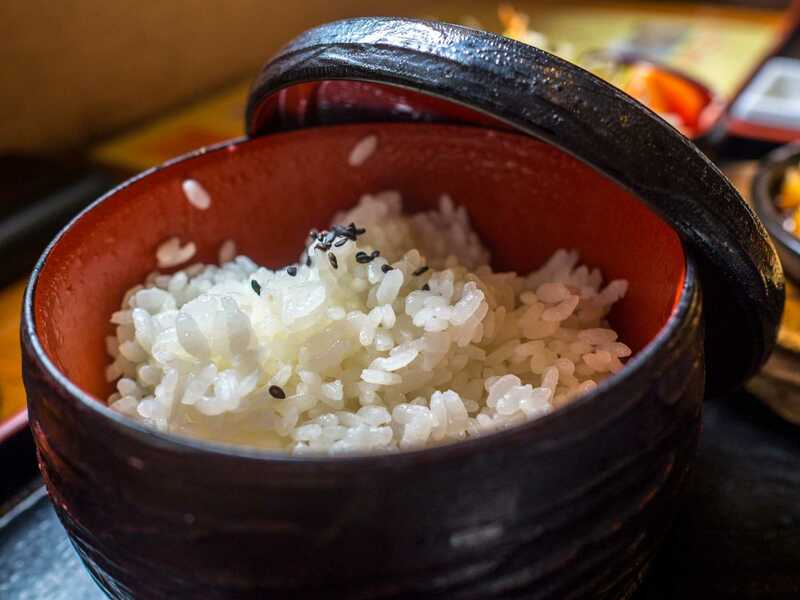 No meal is complete in Japan without steamed rice, from breakfast through late night. The name for steamed rice, Gohan, literally means "meal." You must cook it properly and with the respect and attention it deserves. Polished, short grain rice (hakumai) is the preferred variety for making steamed rice. Look for Calrose short grain rice, sushi rice, or Japonica rice. You can use a rice cooker (suihanki) or a heavy-based saucepan with a tight-fitting lid. The rice is meant to be a little sticky when cooked so it can be easier to eat with chopsticks. 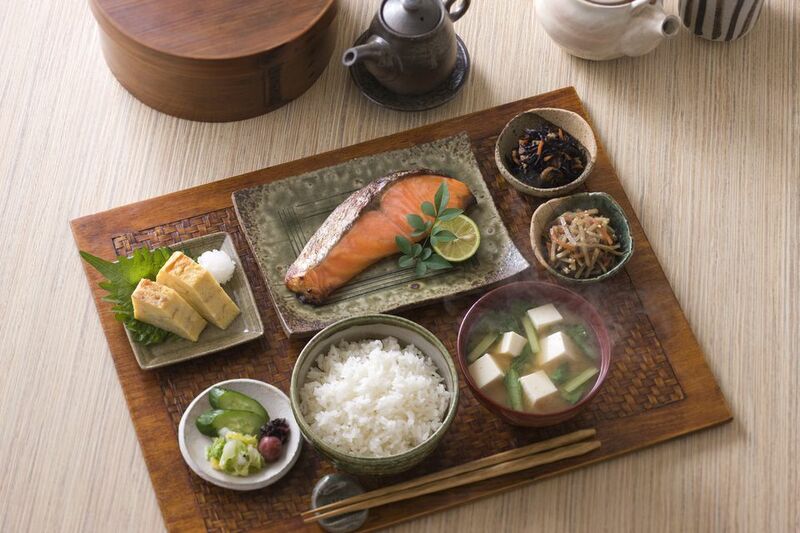 Typical Japanese-style meals include a bowl of miso soup. It is made with dashi soup stock, tofu, miso paste, and green onions. Different types of miso vary in flavor and saltiness, so you can adjust it to your taste. Sushi takes the role of fast food today, both in Japan and around the world. In Japanese cuisine, sushi indicates dishes that use sushi rice, which is seasoned with a sweet vinegar mixture. There are various forms of sushi, including the oval nigiri-zushi topped with seafood, often raw. Maki-zushi is rolled sushi with strips of fish and vegetables laid in rice and rolled inside nori. Hot pot dishes are easily cooked in one large pot and are quite popular in Japanese cuisine. One of the joys of eating hot pot dishes is that the pot is cooked on a portable range on the dining table and enjoyed family style while everyone takes individual portions from the pot. The word "yaki" means "sauté" or "grill" in Japanese, and in making sukiyaki the meat is sauteed in the hot skillet at the table. Traditionally, sukiyaki is a winter dish usually found at bōnenkai, Japanese year-end parties. One hot pot dish to try would include beef sukiyaki, a traditional method for grilling a Japanese-style steak. Ramen noodle dishes are very popular in Japan, with boiled noodles served in differently flavored soup with many toppings. Chefs in Japan usually train very hard to make quality ramen. While you may be used to simply packaged, cheap ramen, making true ramen soup isn't easy if you are making the soup from scratch. Tempura deep-fried vegetables or seafood are very common items in Japanese restaurants. The cooking method which makes tempura batter bloom like a flower in hot oil is called Hanaage), hana means flower and age means deep frying. The traditional confectionery known as wagashi is served with tea in Japan. Daifuku mochi is a type of wagashi and is usually served with green tea. It is most commonly filled with red bean paste, but some are filled with white bean paste (Shiroan). There are also mochi made with soybean flour, Japanese mugwort, matcha green tea powder or a touch of red food coloring.